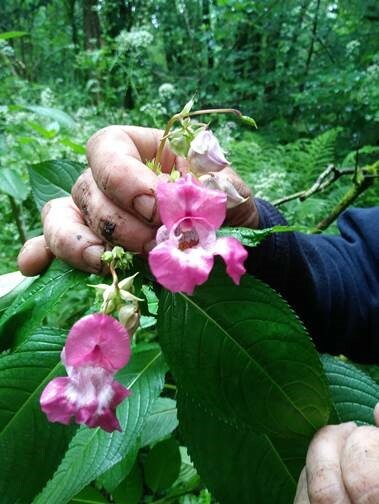 The Wildlife Trust of South and West Wales have been tackling Himalayan Balsam Impatiens glandulifera, a non-native invasive species. Introduced to Kew gardens London in 1839 as an exotic flower, balsam was then spread as a colourful garden species particularly for wet areas. It is also known as Indian balsam, Policeman’s Helmet, Bobby Tops, Nuns, Gnome’s Hatstand, Kiss-me-on-the-mountain and Jumping Jack. Although an annual, this pretty yet ecologically damaging flower grows up to 3metres/10feet in only one spring and summer season. It also has the ability to fling as many as 800 seeds up to 4 metres/13feet from each plant. As opposed to native plants which tend to either grow quickly to a short height or tall slowly. The seeds also float very well, so spread rapidly down water courses. Therefore if not controlled and eradicated, balsam quickly spreads to out-compete our native wildflowers by shading and stealing nutrients. Himalayan balsam also has attractive flowers that likely distract pollinating insects from fertilizing our declining native wild flowers. Furthermore, since Himalayan balsam is non-native from a distance region of the globe, there are no natural ‘predators’. This leaves balsam mostly untouched by herbivorous mammals, birds, reptiles and invertebrates alike. Allowing balsam uninhibited growth and colonisation. In Gelli Hir, a reserve on Gower near Three Crosses, there has been a consistent effort over several years by a dedicated team of volunteers to beat balsam. For this site, many affected areas are difficult to access. Plants are between trees, in bramble thickets and in wet/boggy ground. Yet, fear not, it is easy to pull! 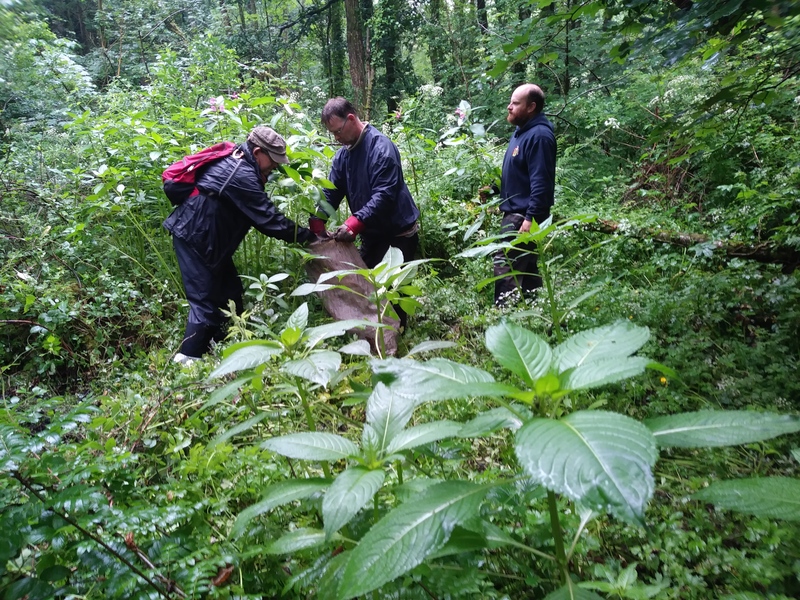 The most effective way to clear balsam is to pull it up by the roots and leave it to rot down in heaps or builders sacks strategically placed for access and to prevent further spread. Alternatively once pulled, the bottom node (fat join part) should be squished; plants can then be hung up in trees so the roots dry out, cannot touch the ground, or any moisture giving branch to regrow. Last summer, volunteers have made giant leaps forward in clearing the entire area from the stream’s entrance to the reserve (where the balsam enters) all the way down to the pond. Even making a trip out to the island to pull each and every plant they could find. Another member of Wildlife Trust staff Rebecca Killa, recently visited Gelli Hir. Rebecca used to work on this reserve and started the balsam effort there, said “I’m amazed at the progress and to see it so clear”. The next stage this year is pulling any plants that were previously hidden or missed, any that are residing dormant in the seed bank and any new influx from the stream, hopefully restricted close to the bank sides. To help make a difference with this and other important conservation work, please volunteer, or if you are unable to come out on volunteer work parties, please support them by joining as a much needed member or leaving a legacy www.welshwildlife.org/support-us/ so they may continue their vital work.